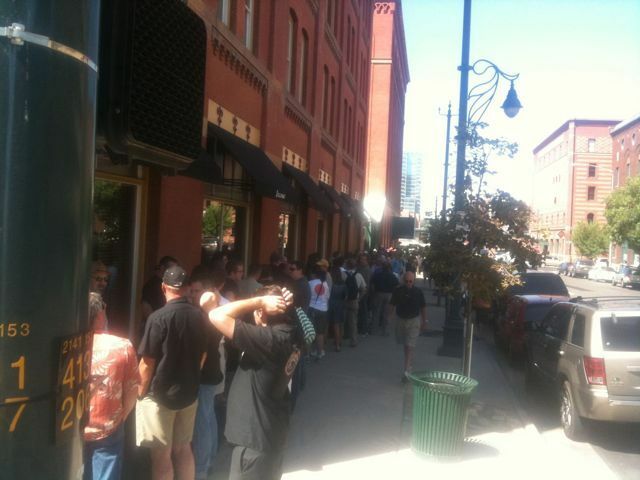 Here’s an attempt to post a video of the line that wraps around the block at Wynkoop Brewing as we all wait to get into the rare beer tasting. Who would pay $80 to taste rare beers? Turns out lots of guys. Don and I hustler Dave from Drunken Polack. Helluva guy! Still waiting for my first beer. Hopefully this line moves fast. ← GABF: Here We Go! Wow, looks like it could be a challenge going to dinner downtown tonight. Good luck with that line. At least you’ll be good and thirsty by the time you get to taste some beers.